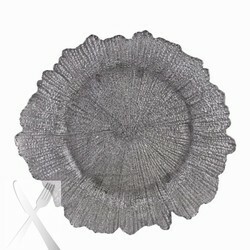 Perfect for holding your dinnerware during upscale parties and other special events, the Ten Strawberry Street Silver Reef Glass Charger Plate 13" is an excellent addition to your restaurant, hotel or catering company. Designed with a wavy rim and a texture that resembles coral reefs, this charger plate will add a unique touch to any table setting. Constructed from glass, this charger plate offers a luxurious feel that your guests will surely appreciate. Thanks to its beautiful shade of silver, this charger plate will suit a variety of table arrangements as well as add an elegant touch to your setup. Handwashing is recommended to keep this charger plate In excellent condition.